Pear shapes feature a rounded edge tapering to a point at the opposite end. This unique shape flatters fingers and offers a distinctive look. A fusion of the marquise shape and the most popular round brilliant cut, pear shaped diamonds are intended to showcase the sparkle of the diamond, making it important to find a stone with great symmetry. The modified brilliant cut pear shaped diamond is a combination of a round and a marquise shape, with a tapered point on one end. The diamond is always worn with the narrow end pointing toward the hand of the wearer. Like marquise and oval cuts, the pear shaped diamond comes in a variety of slim to wide cuts, and has the added benefit of making the wearer's fingers appear longer and slimmer. 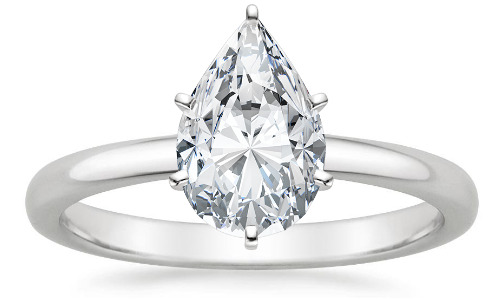 The pear shape is a unique and hybrid diamond cut combining the brilliance and design style of both the round brilliant and the marquise that results in a shape with a single point and rounded end. The typical ratio is between 1.50 and 1.70 and the stone is usually comprised of 58 facets, although the number of pavilion facets may range from 4 to 8. Additionally, pear shapes are sometimes cut with a "French tip," which replaces the large bezel facet at the point with star and upper girdle facets. French tips are also used in the heart and marquise shapes. Pear shaped diamonds may vary in appearance with some having what is referred to as "high shoulders", making the stone appear more angular. The pear shape can suffer from a so-called "bow-tie effect" when light passing through the diamond casts a shadow across the central facets of the stone. This shadow can be reduced by altering the depth of the pavilion, and adjusting the angles of the table and facets to better diffuse light in the central area. This effect also occurs in the heart, marquise and oval shapes. The optimal pear shape is one with a polished girdle and a rounded base, or "even shoulders". However, much like the oval cut, a more attenuated pear shape may elongate the fingers, so it is important to reconcile these two qualities. Additionally, color is often more visible towards the tip of the pear shape, so to ensure an even tone throughout the stone it is advisable to opt for colors H and above. Ideally, a pear shaped diamond should possess excellent or very good symmetry. The point should line up with the apex of the rounded end. The shoulders and wings (the upper and lower curves on the right and left side of the diamond) should form uniform, symmetrical curves, with no straight edges. The rounded top should not appear narrow or squat, but like a semi-circle. In a misguided effort to add weight to a diamond (by incorporating more of the rough stone in the final cut) cutters may give the diamond added girth near the point or top, giving the diamond a squared off or squatty appearance. While the length to width ratio of classic pear shaped diamonds is 1.40-1.70, personal preference will again dictate choice. 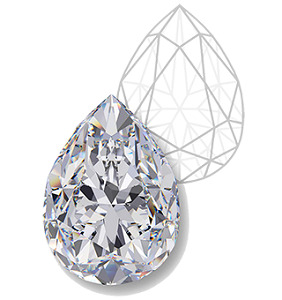 The shape preference may also be affected by the diamond's eventual setting: A narrow pear diamond is ideal for dangle earrings, while a wider shape might be preferred for a solitaire ring. A pear diamond should always be set with a prong at the point, the most likely location for chipping on a pear cut diamond. Because this point was once nearest the outer edge of the rough stone, flaws such as naturals, extra facets, and other inclusions may be located here. Since the point is covered by a prong, these flaws will be invisible once the diamond is set. The only remaining concern would be if the flaws are significant enough to affect the stability of the diamond (this is extremely rare, however). The first pear shaped diamond was created in the 1400s by Flemish cutter Lodewyk van Berquem of Bruges, inventor of the diamond-polishing wheel, or scaif. This invention enabled him to polish all the facets of the diamond to optimize light reflection within it. It was from this watershed moment onwards that diamonds began to be used in jewellery. Van Berquem also pioneered the now commonplace symmetrical arrangement of facets on a stone, this in turn led him to fashion the pear shaped "Pendeloque" or "Briolette" cut.